The third of three films that composer John Barry did for producer/director Francis Ford Coppola, this 1986 release starred Kathleen Turner and Nicolas Cage in a fantasy about a stressed-out mom who seemingly travels back in time to her high-school days and faces the possibility of altering her own destiny. I love Barry’s romantic scores from the ’80s (including Somewhere in Time, Body Heat and Out of Africa) and it was a pleasure to contribute notes to this first-ever complete release of his memorable music for Peggy Sue. 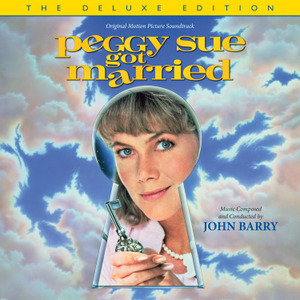 This entry was posted in Composers, Film Music and tagged Francis Ford Coppola, John Barry, Peggy Sue Got Married, Varese Sarabande on December 1, 2014 by Jon Burlingame.